The Network Time Protocol (NTP) Version 3, which is used to synchronize timekeeping among a set of distributed time servers and clients. It defines the architectures, algorithms, entities, and protocols used by NTP. NTP was first described in RFC-958. NTP Version 2 described in RFC-1119. It is built on the Internet Protocol (IP), and User Datagram Protocol (UDP), which provide a connectionless transport mechanism; however, it is readily adaptable to other protocol suites. NTP is evolved from the Time Protocol and the ICMP Timestamp message but is specifically designed to maintain accuracy and robustness, even when used over typical Internet paths involving multiple gateways, highly dispersive delays, and unreliable nets. It provides the protocol mechanisms to synchronize time in principle to precisions in the order of nanoseconds while preserving a non-ambiguous date well into the next century. The protocol includes provisions to specify the characteristics and estimate the error of the local clock and the time server to which it may be synchronized. It also includes provisions for operation with a number of mutually suspicious, hierarchically distributed primary reference sources such as radio-synchronized clocks. The Digital Time Service (DTS) has many of the same service objectives as NTP. The DTS design places heavy emphasis on configuration management and correctness principles when operated in a managed LAN or LAN-cluster environment, while NTP places heavy emphasis on the accuracy and stability of the service operated in an unmanaged, global internet environment. In DTS a synchronization subnet consists of clerks, servers, couriers and time providers. With respect to the NTP nomenclature, a time provider is a primary reference source, a courier is a secondary server intended to import time from one or more distant primary servers for local redistribution and a server is intended to provide time for possibly many end nodes or clerks. Unlike NTP, DTS does not need or use mode or stratum information in clock selection and does not include provisions to filter timing noise, select the most accurate from a set of presumed correct clocks or compensate for inherent frequency errors. In fact, the latest revisions in NTP have adopted certain features of DTS in order to support correctness principles. These include mechanisms to bound the maximum errors inherent in the time-transfer procedures and the use of a provably correct (subject to stated assumptions) mechanism to reject inappropriate peers in the clock-selection procedures. The Fuzzball routing protocol, sometimes called Hellospeak, incorporates time synchronization directly into the routing-protocol design. One or more processes synchronize to an external reference source, such as a radio clock or NTP daemon, and the routing algorithm constructs a minimum-weight spanning tree rooted on these processes. The clock offsets are then distributed along the arcs of the spanning tree to all processes in the system and the various process clocks corrected using the procedure. In the NTP model a number of primary reference sources, synchronized by wire or radio to national standards, are connected to widely accessible resources, such as backbone gateways, and operated as primary time servers. The purpose of NTP is to convey timekeeping information from these servers to other time servers via the Internet and also to cross-check clocks and mitigate errors due to equipment or propagation failures. Some number of local-net hosts or gateways, acting as secondary time servers, run NTP with one or more of the primary servers. In order to reduce the protocol overhead, the secondary servers distribute time via NTP to the remaining local-net hosts. In the interest of reliability, selected hosts can be equipped with less accurate but less expensive radio clocks and used for backup in case of failure of the primary and/or secondary servers or communication paths between them. NTP is designed to produce three products: clock offset, roundtrip delay, and dispersion, all of which are relative to a selected reference clock. Clock offset represents the amount to adjust the local clock to bring it into correspondence with the reference clock. Roundtrip delay provides the capability to launch a message to arrive at the reference clock at a specified time. Dispersion represents the maximum error of the local clock relative to the reference clock. Since most host time servers will synchronize via another peer time server, there are two components in each of these three products, those determined by the peer relative to the primary reference source of standard time and those measured by the host relative to the peer. Each of these components is maintained separately in the protocol in order to facilitate error control and management of the subnet itself. They provide not only precision measurements of offset and delay, but also definitive maximum error bounds so that the user interface can determine not only the time but the quality of the time as well. Data integrity is provided by the IP and UDP checksums. No flow-control or re-transmission facilities are provided or necessary. Duplicate detection is inherent in the processing algorithms. The service can operate in a symmetric mode, in which servers and clients are indistinguishable, yet maintain a small amount of state information, or in client/server mode, in which servers need to maintain no state other than that contained in the client request. A lightweight association-management capability, including dynamic reachability and variable poll-rate mechanisms, is included only to manage the state information and reduce resource requirements. Since only a single NTP message format is used, the protocol is easily implemented and can be used in a variety of solicited or unsolicited polling mechanisms. In what may be the most common client/server model a client sends an NTP message to one or more servers and processes the replies as received. The server interchanges addresses and ports overwrites certain fields in the message, recalculates the checksum and returns the message immediately. Information included in the NTP message allows the client to determine the server time with respect to local time and adjust the local clock accordingly. In addition, the message includes information to calculate the expected timekeeping accuracy and reliability, as well as select the best from possibly several servers. While the client/server model may suffice for use on local nets involving a public server and perhaps many workstation clients, the full generality of NTP requires distributed participation of a number of client/servers or peers arranged in a dynamically re-configurable, hierarchically distributed configuration. It also requires sophisticated algorithms for association management, data manipulation, and local-clock control. Throughout the remainder of this document, the term host refers to an instantiation of the protocol on a local processor, while the term peer refers to the instantiation of the protocol on a remote processor connected by a network path. Figure 1 shows an implementation model for a host including three processes sharing a partitioned database, with a partition dedicated to each peer, and interconnected by a message-passing system. The transmit process, driven by independent timers for each peer, collects information in the database and sends NTP messages to the peers. Each message contains the local time stamp when the message is sent, together with previously received time stamps and other information necessary to determine the hierarchy and manage the association. The message transmission rate is determined by the accuracy required of the local clock, as well as the accuracies of its peers. The receive process receives NTP messages and perhaps messages in other protocols, as well as information from directly connected radio clocks. When an NTP message is received, the offset between the peer clock and the local clock is computed and incorporated into the database along with other information useful for error determination and peer selection. A filtering algorithm improves the accuracy by discarding inferior data. The update procedure is initiated upon receipt of a message and at other times. It processes the offset data from each peer and selects the best one using the algorithms. This may involve many observations of a few peers or a few observations of many peers, depending on the accuracies required. 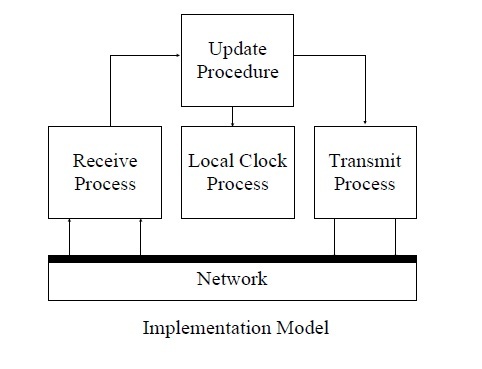 The local-clock process operates upon the offset data produced by the update procedure and adjusts the phase and frequency of the local clock using the mechanisms. This may result in either a step-change or a gradual phase adjustment of the local clock to reduce the offset to zero. The local clock provides a stable source of time information to other users of the system and for subsequent reference by NTP itself. The synchronization subnet is a connected network of primary and secondary time servers, clients and interconnecting transmission paths. A primary time server is directly synchronized to a primary reference source, usually a radio clock. A secondary time server derives synchronization, possibly via other secondary servers, from a primary server over network paths possibly shared with other services. Under normal circumstances, it is intended that the synchronization subnet of primary and secondary servers assumes a hierarchical-master-slave configuration with the primary servers at the root and secondary servers of decreasing accuracy at successive levels toward the leaves. This section consists of a formal definition of the Network Time Protocol, including its data formats, entities, state variables, events and event-processing procedures. The specification is based on the implementation model illustrated in Figure, but it is not intended that this model is the only one upon which a specification can be based. In particular, the specification is intended to illustrate and clarify the intrinsic operations of NTP, as well as to serve as a foundation for a more rigorous, comprehensive and verifiable specification. All mathematical operations expressed or implied herein are in two’s-complement, fixed-point arithmetic. Data are specified as integer or fixed-point quantities, with bits numbered in big-endian fashion from zero starting at the left, or high-order, position. Since various implementations may scale externally derived quantities for internal use, neither the precision nor decimal-point placement for fixed-point quantities is specified. Unless specified otherwise, all quantities are unsigned and may occupy the full field width with an implied zero preceding bit zero. Hardware and software packages designed to work with signed quantities will thus yield surprising results when the most significant (sign) bit is set. It is suggested that externally derived, unsigned fixed-point quantities such as timestamps are shifted right one bit for internal use since the precision represented by the full field width is seldom justified. Since NTP timestamps are cherished data and, in fact, represent the main product of the protocol, a special timestamp format has been established. NTP timestamps are represented as a 64-bit unsigned fixed-point number, in seconds relative to 0h on 1 January 1900. The integer part is in the first 32 bits and the fraction part in the last 32 bits. This format allows convenient multiple-precision arithmetic and conversion to Time Protocol representation (seconds) but does complicate the conversion to ICMP Timestamp message representation (milliseconds). The precision of this representation is about 200 picoseconds, which should be adequate for even the most exotic requirements. Timestamps are determined by copying the current value of the local clock to a timestamp when some significant event, such as the arrival of a message, occurs. In order to maintain the highest accuracy, it is important that this is done as close to the hardware or software driver associated with the event as possible. In particular, departure timestamps should be redetermined for each link-level retransmission. In some cases, a particular timestamp may not be available, such as when the host is rebooted or the protocol first starts up. In these cases the 64-bit field is set to zero, indicating the value is invalid or undefined. The protocol uses various state variables and parameters. They are separated into classes of system variables, which relate to the operating system environment and local-clock mechanism; peer variables, which represent the state of the protocol machine specific to each peer; packet variables, which represent the contents of the NTP message; and parameters, which represent fixed configuration constants for all implementations of the current version. For each class, the description of the variable is followed by its name and the procedure or value which controls it. Note that variables are in lower case, while parameters are in upper case. Variables are common to two or more of the system, peer and packet classes. Additional variables are specific to the optional authentication mechanism. When necessary to distinguish between common variables of the same name, the variable identifier will be used. In addition to the common variables described previously, the following variables are used by the operating system in order to synchronize the local clock. In addition to the common variables described previously, the following variables are used by the peer management and measurement functions. In addition to the common variables described previously, the following variables are defined. Version Number (pkt.version): This is an integer indicating the version number of the sender. NTP messages will always be sent with the current version number NTP.VERSION and will always be accepted if the version number matches NTP.VERSION. Exceptions may be advised on a case-by-case basis at times when the version number is changed. When the filter and selection algorithms suggested, the following state variables are defined in addition to the variables described previously. When the authentication mechanism suggested, the following state variables are defined in addition to the variables described previously. These variables are used only if the optional authentication mechanism. It is necessary to agree on the values for these parameters in order to avoid unnecessary network overheads and stable peer associations. The following parameters are assumed fixed and applicable to all associations. A host operating in this mode sends periodic messages regardless of the reachability state or stratum of its peer. By operating in this mode the host announces its willingness to synchronize and be synchronized by the peer. This type of association is ordinarily created upon arrival of a message from a peer operating in the symmetric active mode and persists only as long as the peer is reachable and operating at a stratum level less than or equal to the host; otherwise, the association is dissolved. However, the association will always persist until at least one message has been sent in reply. By operating in this mode the host announces its willingness to synchronize and be synchronized by the peer. A host operating in this mode sends periodic messages regardless of the reachability state or stratum of its peer. By operating in this mode the host, usually a LAN workstation, announces its willingness to be synchronized by, but not to synchronize the peer. This type of association is ordinarily created upon arrival of a client request message and exists only in order to reply to that request, after which the association is dissolved. By operating in this mode the host, usually, LAN time server, announces its willingness to synchronize, but not to be synchronized by the peer. A host operating in this mode sends periodic messages regardless of the reachability state or stratum of the peers. By operating in this mode the host, usually a LAN time server operating on a high-speed broadcast medium, announces its willingness to synchronize all of the peers, but not to be synchronized by any of them.